Whether exploiting the pure sound created by the synergy of two acoustic guitars, or exploring what happens when an acoustic guitar meets a jazzy electric counterpart, the two virtuosos Sönke Meinen and Philipp Wiechert freely combine and celebrate a whole variety of influences including fingerstyle, classical guitar, jazz and folk (to name but a few!). 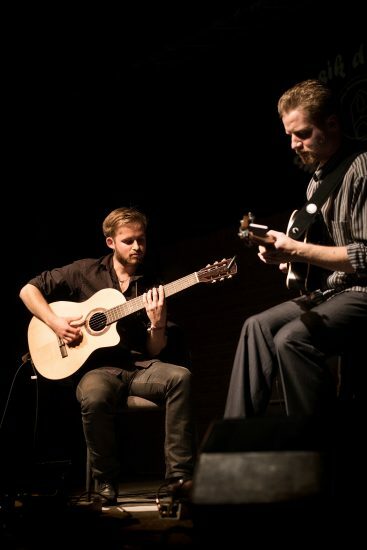 Both Sönke Meinen and Philipp Wiechert studied at the College of Music „Carl Maria von Weber“ in Dresden, Sönke studying acoustic guitar, Philipp doing jazz, and they started collaborating in 2011. Their debut album – “PhiliSöphical Journey“ – was released on the renowned guitar label “Acoustic Music Records” and since then, in more than 100 concerts, they have shared the stage with guitar greats like Peter Finger, Adam Rafferty and Richard Smith. Sönke Meinen also performs solo and together with violin virtuoso Bjarke Falgren or jazz singer Anna-Lucia Rupp. He has won numerous prizes since his first stage appearances, and in 2016 he collected awards at two of the largest international guitar competitions: the well-respected „Guitar Masters“ (first prize) and the European Guitar Award (sponsoring prize). The Australian guitar wizard Tommy Emmanuel introduced Sönke Meinen to his audience as „one of the most creative guitarists in the scene today“. Philipp Wiechert is the founder of the modern-gypsy-swing band “Friling“ with which he released two albums. Philipp also performs together with bass player Sebastian Braun, occasionally complemented by jazz singer Pascal von Wroblewsky as the „Pascal von Wroblewsky Trio“. Philipp and Sönke are also the artistic directors of the annual „Internationales Freepsumer Gitarrenfestival“. In 2013 they were the front cover story of the German magazine “Akustik Gitarre“. The authors of the lead article remarked that their different stylistic approaches do not constitute a barrier, but rather exactly the opposite: a common source of bountiful inspiration! The magazine also referred to their playing as “an unflinchingly telepathic symbiosis of two wonderful guitar parts”.